Photo by Executive Office of the President of the United States. 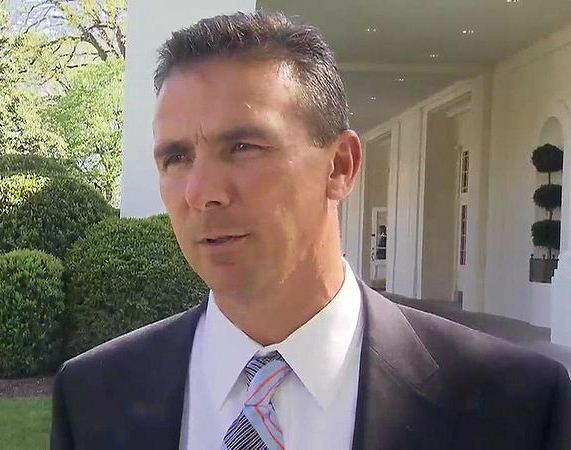 I’ve got no beef with Urban Meyer, per se. Sure, I was never much persuaded by his “health issue” excuse for leaving the University of Florida, nor for his ancillary “I want to spend more time with my family” explanation, but neither did I much care. His conclusion now, barely a year later, that he’s healthy enough, and that he’s banked enough time with his family, to accept the head coaching job at Ohio State bothers me not one whit. Gator fans, feeling abandoned and betrayed, may hate him, and Buckeye fans, feeling desperate and anxious, may love him, but me? I don’t care. Urban should be free to do whatever Urban wants to do. I do, however, have a beef with the exalted status we’ve come to bestow upon college football coaches in general, and, more specifically, with the vast amounts of public and public-affiliated funds we expend in paying them tribute. If USA Today’s reporting is correct (see here), the aggregated sum paid as salary to the top 15 most highly paid college football coaches in America exceeds $51 million. That’s an average of more than $3.4 million per coach per year, and that’s only in salary–it does not include bonuses, incentives, perks, severance packages, and other forms of compensation, all of which boost the actual numbers far higher. Every one of these college football coaches earns not merely more, but many multiples more, than the President of the university at which the coach is employed. Of even more significance, though, is this: Every single one of the top 15 most highly paid college football coaches in America–every single one of these coaches whose annual salaries range from $2.75 million to $5.2 million–is employed by a public, not a private, university. That’s right. Every single one of these multi-million-dollar coaches is a public employee. To which I say, bunk and shame. Schools pay top dollar for “top coaches” on the premise that winning at football will lead to greater revenue, and that paying more for a top coach will produce more of those precious wins. The numbers, however, tell a less definitive tale. As of the date of this post, for the 2011 season, the top 15 most highly paid college football coaches have a combined winning record of 71%, with only 10 of those coaches having earned their respective schools an AP Top 25 ranking. On the other hand, the winning percentage of the 15 other teams in the AP Top 25–the teams whose coaches are not among the 15 most highly paid–is 84%. Paying more money doesn’t guarantee the most wins. I cannot assert as fact, but I’d nevertheless be willing to wager, that if every public university pledged to cap the salary of its head football coach at $500,000 per year, an abundance of qualified coaches would nevertheless be eager to apply for these positions, television networks would still be desirous of paying for broadcast rights, sporting goods manufacturers would continue to pay for endorsements, and a core base of fans would still buy tickets to games. With a finite number of public universities, a virtually infinite number of qualified people eager to coach a public university’s football team, and a flush crowd of steady revenue sources, why have we used public or public-affiliated funds to create–and why do we continue to tolerate–a category of campus-based sports managers who are compensated as though they were royalty? It makes no sense. The cost of attending a public university has increased 37% over the past ten years (see chart, here), and student debt over the same period has risen a staggering 511% (see chart, here). In these difficult economic times, the disconnect between the most highly paid employee at most public universities (the football coach) and the financially strapped people those universities were chartered to serve (the students) is jarring. For all the jabbering among politicians about excessive government spending of one sort or another, why is no one calling for the dethronement of our public university kings?